We build our living structures using contemporary and traditional natural building methods and locally sourced materials. 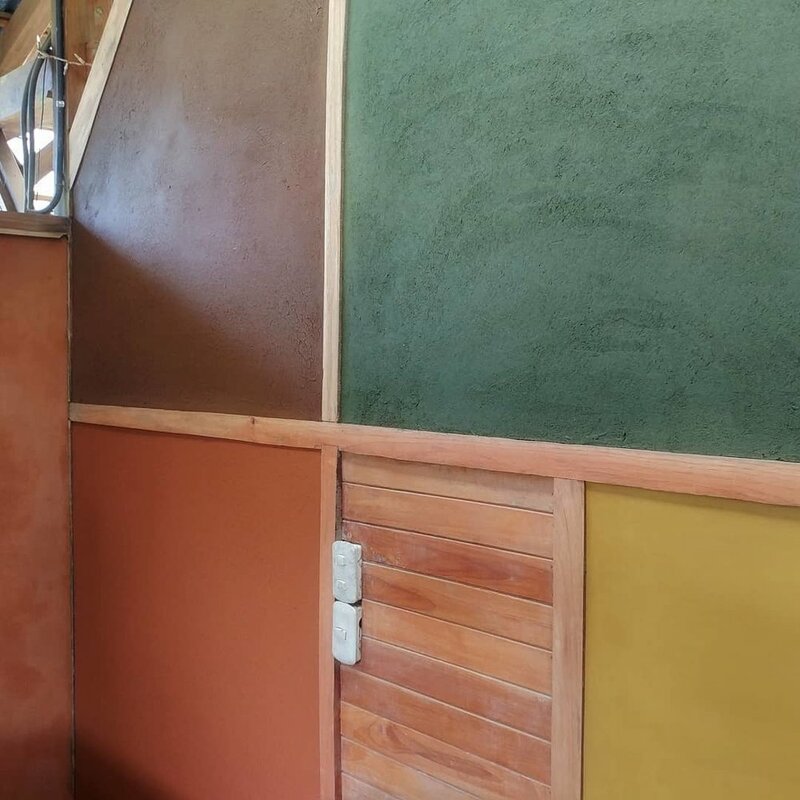 We construct with bamboo, cob, wattle and daub, light clay, natural plasters and wood and stone sourced from the area's surrounding forests and rivers and design/build all of our own edifices. We have various options to choose from and will do our utmost to match you with the alternative that best meets your desires, budget and needs. Our lodging rates include all meals. The price for children over 3 and up to 12 years is $30 per night. Costa Rican Nationals get a 15% discount on lodging. Meals at the Ranch are cooked from scratch, delicious, and plentiful with the majority of ingredients coming from the Ranch and a variety of local farms. Please let us know if you have any special dietary requirements prior to arriving. For more information about ethics surrounding food and our kitchen, see our Food Systems page. Please fill out our Availability Request Form if you would like to stay with us and to inquire about space. For payment information, please go to our Payment Information Page. We look forward to hearing from you soon. Please contact us with any questions. Bernie's Bungalows are our newest naturally built lodging option. This beautiful timber frame, wattle and daub, lime/clay plastered building has 3 private rooms. The building was designed by Ranch core team member Nic Donati and is the latest example of the Ranch's naturally built infrastructure. The bungalows are near the Ranch's classroom with views into one of our orchards. We are currently renting the rooms at Bernie's though the exterior plaster will not be applied until later in the year. The structure is currently serviced by 2 nearby composting toilets. There is running water and electricity. The shower structure for Bernie's will not be complete until 2019. Bernie's is currently served by a temporary outdoor shower. In early 2008, we began construction on a structure called Starboard Cork, named after a song written by Deivis Garcia and commonly performed by Alan Smith and his band The Porchistas. The timber frame and wattle and daub house, designed by Tyler See, Geoff Kinder and Alan Smith, and constructed with the hands of many is a fabulous place to live and stay. 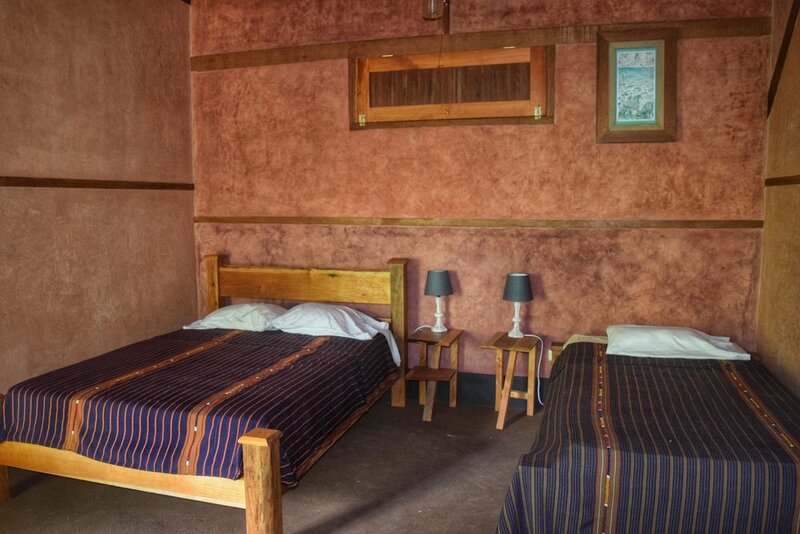 It boasts two beautiful bedrooms, a spectacular common space, and wonderful earthen plasters and floors. It is accompanied by a lovely timber frame composting toilet/shower structure and has some of the best views imaginable. This house looks out over Mastatal's soccer field and is only a few minutes walk from the Main House. It has commanding views of La Cangreja and provides one of the most spectacular wake up experiences one could imagine. The post and beam construction can sleep up to six people and is a wonderful space for families and others wanting a bit of privacy. The upstairs has a double and two single beds and the downstairs bedroom has a double bed. 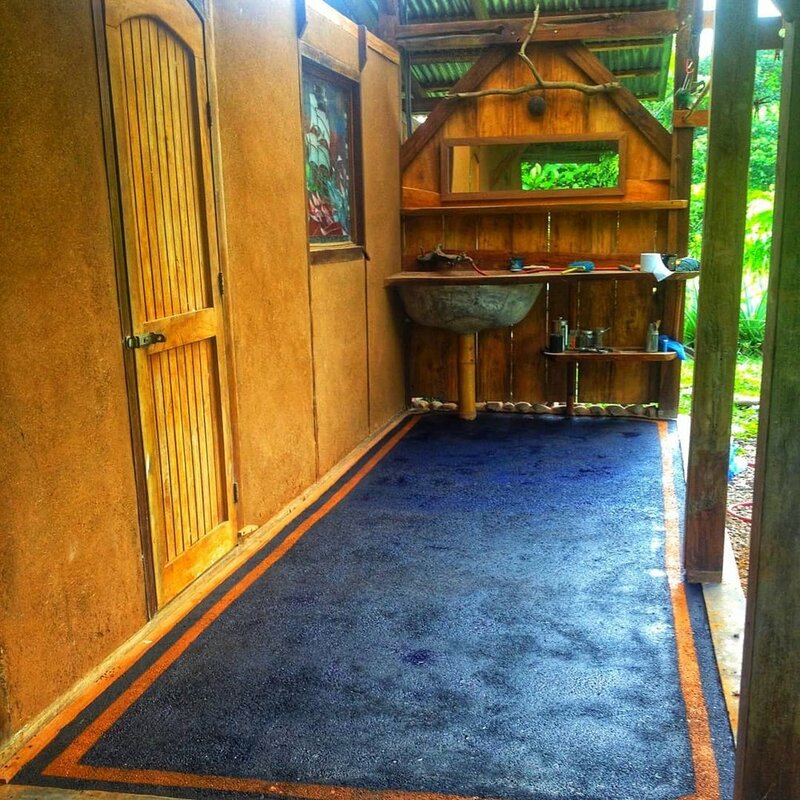 The house is serviced by an outdoor shower and composting toilet. Jeanne's house is an attractive structure set amongst mango, banana, pejibaye (peach palm), pili nut, breadfruit, salak palm, pulasan, cashew, startfruit, mangosteen and other tropical fruit trees. The house is outfitted with nine beautiful bamboo bunkbeds, one single bed, a few hammocks, running water, electricity, two nearby composting toilets, two passively solar heated showers and an indoor shower. The house accompanies 65 acres of protected forest, six kilometers of trails, a 60-foot cascade, views to the national park, and beautiful swimming holes. Jeanne’s is also home to our agroforestry nurseries. The main house is set on the edge of our 235-acre private wildlife refuge and features close proximity to 7 kilometers of forest trails, abundant wildlife, waterfalls, rivers, swimming holes and beautiful forests that border the La Cangreja National Park. This is the heart of the Ranch. The house is less than a one minute walk to town and contains one bedroom with a double bed and the Ranch's administrative offices. The bedroom has custom built cedar shutters that fold to the outside and a ceiling fan. There is a bathroom next door to the bedroom with a shower and toilet making this lodging option a good choice for those guests needing a nearby bathroom. The toilet feeds our biodigester. There are numerous hammocks on the porches in which to read a book or nap. The house is also home to the Ranch's library and is the principle hangout for our dog Jack and our two cats, Maximo and Chester. The main house is generally the most active place at the Ranch, and where all meals are served, so please keep this in mind if you're interested in staying here. There can be a lot of action here at times. It also contains the kitchen's beautiful gardens, a nursery, an earthen oven, the Ranch kitchen and space to read, write and relax. During less busy times of the year, we also occasionally rent out a number of other structures at Rancho Mastatal. These include the Casucha, the Honey Hut, the Hankey House, the Goat Barn, Nic and Ali’s House, Sole’s House and La Choza. These buildings are core team member or apprentice houses during much of the year but are open to guests when core team members and/or apprentices are not on site. Please fill our our Availability Request Form to inquire about space and to stay with us.